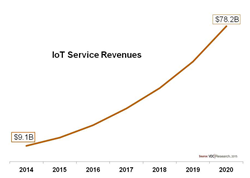 Internet of Things (IoT) services revenue is expected to rise from $ 9.1 billion worldwide in 2014 to $ 78.2 billion in 2020, a compound annual growth rate of 43.2%, according to VDC Research (click here for more info). Such rapid growth of IoT services is enabled by the increase in cumulative installed base of Internet-connected devices—including those retrofitted with connectivity via gateways. IoT-specific services include connectivity, device monitoring and control, data collection and storage, and data analytics. These services are provided by a wide variety of vendors who offer horizontal infrastructure and platforms, and/or vertical market expertise. Industrial automation is currently the largest market for IoT services, but automotive/transportation and medical/healthcare are the fastest growing sectors. 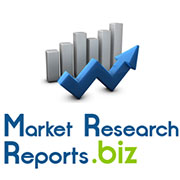 VDC Research is a leading technology market analyst firm covering the connected world, focusing on embedded devices and enterprise mobility. Founded in 1971, the firm provides critical market intelligence to the world’s leading technology vendors, who rely on its analysts for the data, ideas, and insights they need to make impactful strategic decisions with confidence. National Regulatory Services (NRS), part of Accuity, today announced the release of the ComplianceMAX (cMAX) Customer Complaints Module, created to allow its users to confidently manage, utilize and archive information pertaining to customer complaints. The module helps broker-dealers comply with FINRA Rule 4530 by centralizing all customer complaint information into a configurable workflow and automating FINRA filings. In an environment of increased regulatory scrutiny, failure to implement adequate controls can result in significant reputational damage and potential regulatory fines. Effectively managing customer complaints requires timely action and awareness of every step of an issue’s resolution status. The cMAX Customer Complaints Module allows firms to properly identify, report and resolve each individual complaint against registered representatives and the firm itself. For more information or to arrange a demo of the module, please visit http://www.nrs-inc.com/Complaints. Owned by the Reed Elsevier, National Regulatory Service (NRS) is part of Accuity, the global standard for payment efficiency and compliance solutions. NRS is a leading provider of compliance consulting, education, technology and outsourced services for investment advisers, broker-dealers, hedge funds, investment companies and insurance companies. NRS has the practical expertise, proven capability and unparalleled reach to deliver integrated and effective compliance solutions to a wide range of users within the financial services industry. NRS delivers these solutions through three interrelated offerings – comprehensive education, best-in-class technology and expert consulting services – enabling our clients to meet their regulatory requirement and minimize risk. Reed Business Information provides information and online data services to business professionals worldwide. Customers have access to our high-value industry data, analytics, information and tools. Our strong global brands hold market-leading positions across a wide range of industry sectors including banking, petrochemicals and aviation where we help customers make key strategic decisions every day. RBI is part of RELX Group plc, a world-leading provider of information solutions for professional customers across industries. Big Data and predictive analytics solutions are poised to optimize the value of data within the financial services sector. Banks, investment firms, insurance companies and other service providers are learning to leverage the value of data and gain competitive advantage, minimize costs, convert challenges to opportunities, and minimize risk in real-time. Big Data technologies and related business intelligence solutions provide financial services firms with the capability to capture and analyze data, build predictive models, back-test and simulate scenarios. Through iteration, firms will determine the most important variables and also key predictive models. There is a huge opportunity for financial services firms to apply new data sets and new algorithms to optimize capital allocation, cash management, and currency processing. The financial implications are manifest in improved capital flows and profitability for many firms within the ecosystem. How is Big Data expected to impact the financial services industry? What are the Big Data players financial management solutions and their impact? What are the Big Data financial management models and how are they applied? What are the near-term and long-term benefits to the financial services industry? What are the specific challenges that the financial services industry faces with Big Data? Big Data originally emerged as a term to describe datasets whose size is beyond the ability of traditional databases to capture, store, manage and analyze. However, the scope of the term has significantly expanded over the years. Big Data not only refers to the data itself but also a set of technologies that capture, store, manage and analyze large and variable collections of data to solve complex problems. Amid the proliferation of real time data from sources such as mobile devices, web, social media, sensors, log files and transactional applications, Big Data has found a host of vertical market applications, ranging from fraud detection to R&D. Despite challenges relating to privacy concerns and organizational resistance, Big Data investments continue to gain momentum throughout the globe. SNS Research estimates that Big Data investments will account for nearly $ 30 Billion in 2014 alone. These investments are further expected to grow at a CAGR of 17% over the next 6 years. Big Data and predictive analytics solutions are expected to optimise the value of data in the financial services sector. Banks, investment entities, insurers and other service providers are learning how to leverage the value of data and achieve a competitive edge, keep costs to a minimum, transform challenges to opportunities, and minimise risks on a real-time basis. Big Data technologies and associated business intelligence (BI) solutions equip financial services companies with the capability of capturing and analysing data, building predictive models, back-testing and simulating scenarios. By means of iteration, companies will likely determine the most essential variables as well as major predictive models. There is an enormous opportunity for financial service firms to employ novel data sets and new algorithms to optimise cash management, currency processing, and capital allocation. The financial implications make themselves felt in enhanced capital movements and profitability for a slew of firms in the ecosystem. 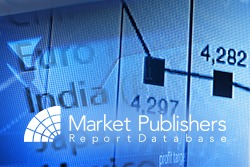 New research report “Big Data in Financial Services Industry: Market Trends, Challenges, and Prospects 2014 – 2019” elaborated by Mind Commerce Publishing is now available at MarketPublishers.com. The market research study provides a comprehensive, unbiased assessment of Big Data prospects and opportunities within the financial services universe. It examines Big Data’s anticipated impact on the financial services sector, looks at Big Data companies’ financial management solutions alongside their influence, gives details of the Big Data financial management models as well as their applications, casts light on the benefits to the financial services industry in the short to long run, and also discusses the major challenges which the financial services industry is facing with Big Data. Companies discussed include: 1010data, Actian, 10gen, Alteryx, Amazon, Attivio, Capgemini,BMC, Booz Allen Hamilton, Cisco Systems, CSC, Dell, Cloudera, EMC, Fusion-io, GoodData, Google, Guavus, Hitachi, HP, IBM, Informatica, Intel, MarkLogic, Microsoft, Mu Sigma, NetApp, Oracle, ParAccel, Opera Solutions, QlikTech, SAP, Splunk, SGI, Teradata, Tibco Software, and Vmware. Detailed forecast figures for Big Data in the financial services sector through to 2019-end. Essential information on the leading firms and solutions for the financial industry. Deep analysis of the role and significance of Big Data in the financial services universe. Insights into the future prospects for Big Data in financial services industry. Review of the initial and on-going implementation areas for Big Data and analytics. More new studies by the publisher can be found at Mind Commerce page.